If you have any questions or want to enquire about dates, use our form to contact Umberto Sereni or see their website for more information. This two-storey farmhouse stands on its own on a hill and commands sweeping views of vineyards and olive groves. Umberto and his family live next door and have been producing balsamic vinegar for generations. Breakfast in the restaurant on the ground floor includes homemade croissants, cakes, jams from the orchard and savoury dishes using home-grown vegetables; lunch and dinner include regional specialities – tigelle, parmesan, prosciutto, tortellini. There’s a terrace with fabulous views and some of the rooms above have terraces too. Take a dip in the swimming pool, spend a lazy afternoon with a book in the glass-walled lounge, take a guided tour of the vinegar factory which includes tastings; walk, ride and rent mountain bikes – the light is incredible at dawn and dusk. The charming towns of Castelvetro or Vignola are 10 minutes’ drive away whilst Modena and Bologna are about 30 minutes away. 1 January - 27 February. Breakfast included. Lunch & dinner, 3 courses, €35 per person. 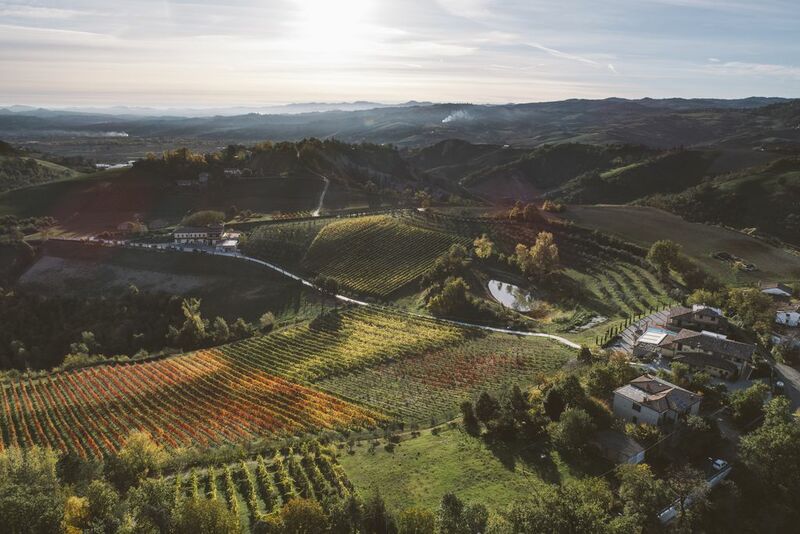 If you want to be in the middle of one of the best food regions in Italy, close by the Ferrari and Lamborghini factories and museums, perched on a hill with stunning views of balsamic vinegar vineyards, and a stone’s throw from Pavarotti’s home town, then this is where you should be. The Sereni family run a welcoming agriturismo with all comforts and will happily take you on an unforgettable tour of their famous factory. I am so looking forward to returning for another visit. 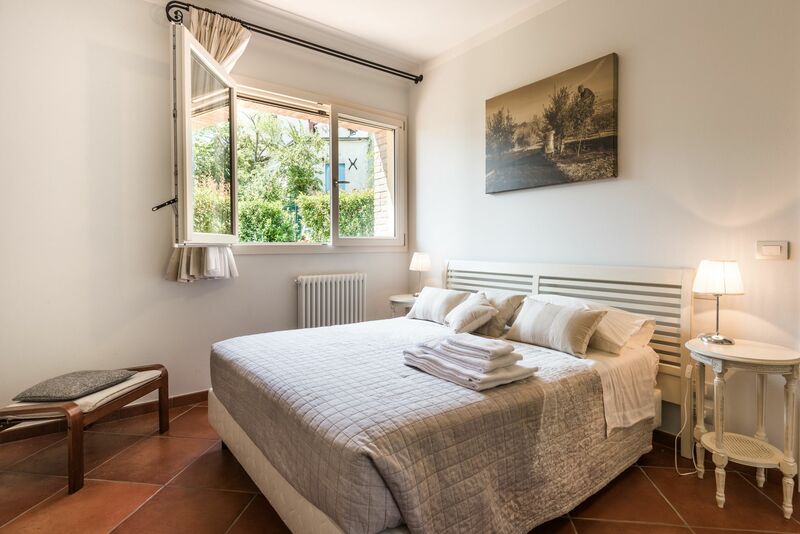 The agriturismo is in the hills between Modena and Bologna and near Castelvetro di Modena, land of the Lambrusco Grasparossa, and the city of cherries, Vignola. Tours can be arranged at the historic Acetaia (vinegar cellar) where Aceto Balsamico di Modena was created. Wine and food lovers can arrange olive oil, Parmigiano-Reggiano and charcuterie production experiences too. 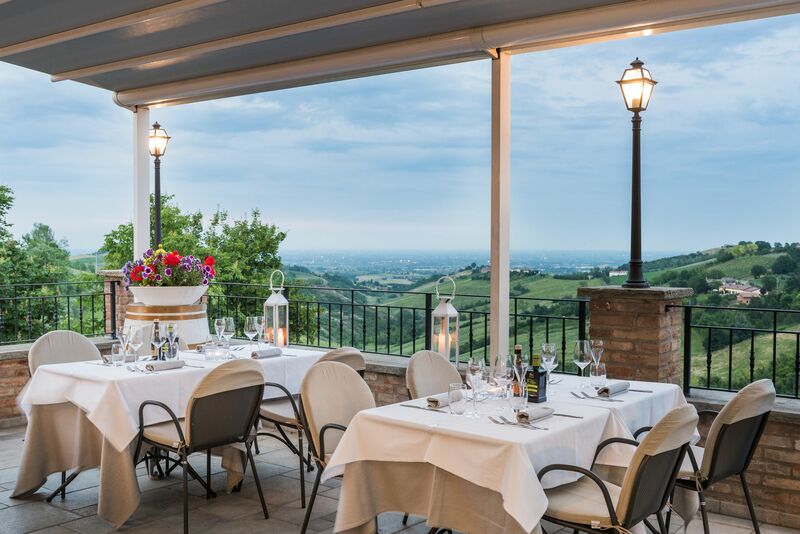 The restaurant offers traditional local dishes, home-produced oil and vinegar, veg from the garden and wines specially selected by the Sereni family. Visit the traditional Acetaia where the famous Aceto Balsamico (balsamic vinegar) of Modena was created, only a few steps from the Agriturismo. Visit the 5 medieval castles all within a 20km- radius and don't miss the famous winding staircase of Barozzi Palace in Vignola. Enjoy a walk or a ride along the paths leading to the nearby hills. Visit the wine cellar a 10-minute drive from the agriturismo. Discover the Parmigiano Reggiano production in a dairy factory 30km from the Agriturismo. Enjoy our food & wine experience: dine on the panoramic terrace with typical Modenese food! The Sereni family are from Modena. They live in the agriturismo and strive to offer guests a traditional Italian (and Emilian) experience. Pier Luigi is the head of the business and responsible of the Aceto Balsamico production; Elisabetta takes care of the admin; Umberto, the firstborn, looks after the guests during breakfast and dinner: Francesco organises food and wine tours; Federica, the youngest, is at school.